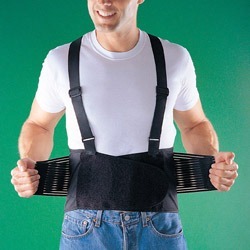 Helps prevent and relieve lower back pain. Easy to apply and remove. Inconspicuous to wear. May be used for both the lumbar and lumbosacral regions. Four pliable support splints in the back for extra stability. 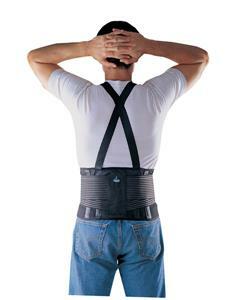 Wrap support around the waist and be sure the four stays are on each side of spine. Adjust the support to desired compression and secure the hook and loop strap to the front of support. Pull the elastic reinforcement straps to tighten, then secure to the front of support. Bring the cross shoulder straps over the shoulders, adjust the length of the cross shoulder straps to tighten.